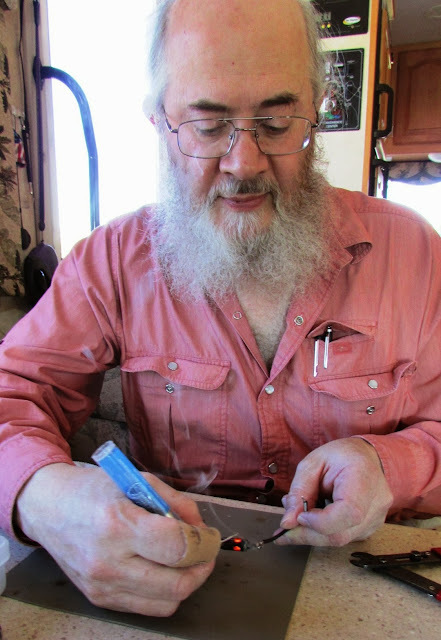 Me and My Dog ...and My RV: RV Engine Mod - to keep the rodents OUT! 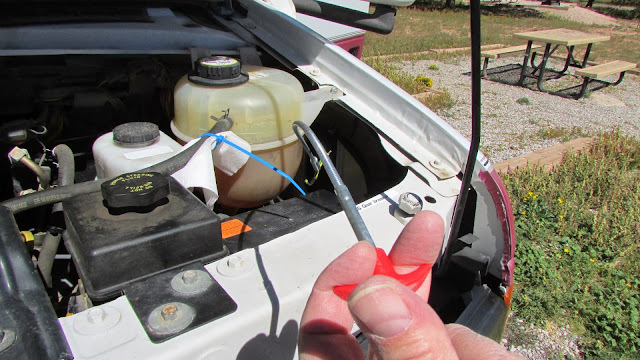 RV Engine Mod - to keep the rodents OUT! 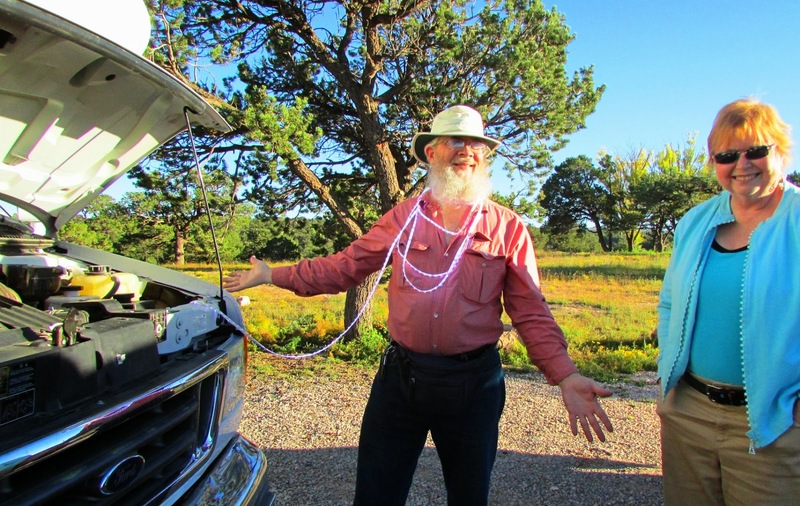 When I realized there had been mice and a squirrel in my engine compartment at El Malpais' Ed Skeen Campground, Andy Baird e-mailed me a photo of the lit up engine of his friends who had also experienced rodent visitors - but they had quite a bit of damage. They installed LED lights around their engine to keep the little critters away. Andy and I decided we were going to order those LEDs, too, and put them in our engine compartments. 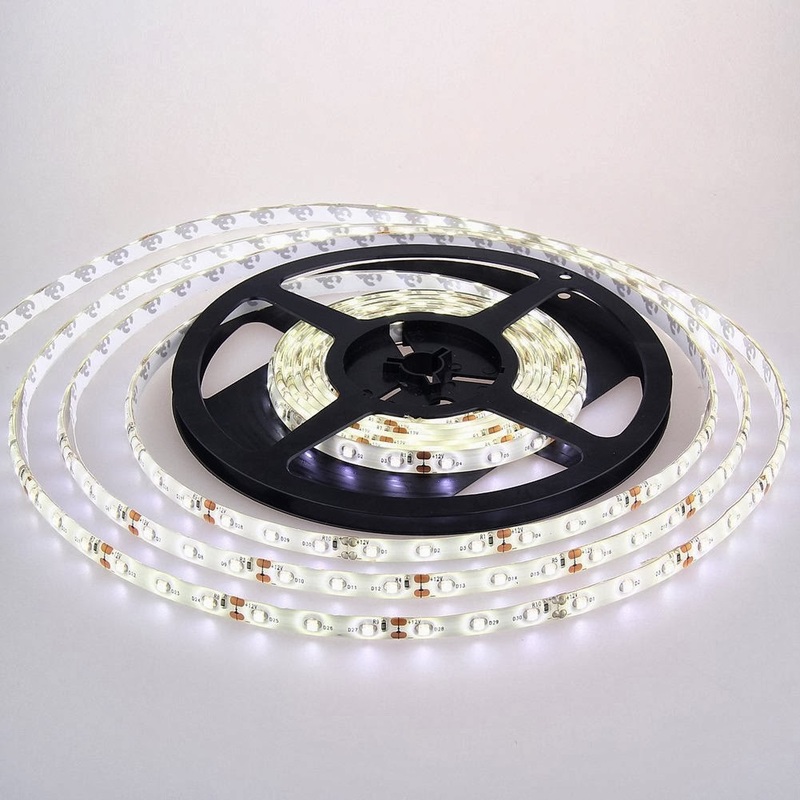 Last week, when we had both received our LED light reels in the mail from Amazon.com, we set up a time to get together and get them installed. Andy had all the parts and tools we needed for the job. First we did his Lazy Daze motor home, and when his was done and he liked the way it worked, we went up to The Palms and did the same thing to my motor home. Andy supplied the parts, tools, knowledge and labor, and I helped with ideas and, ummm, well, ideas and company. 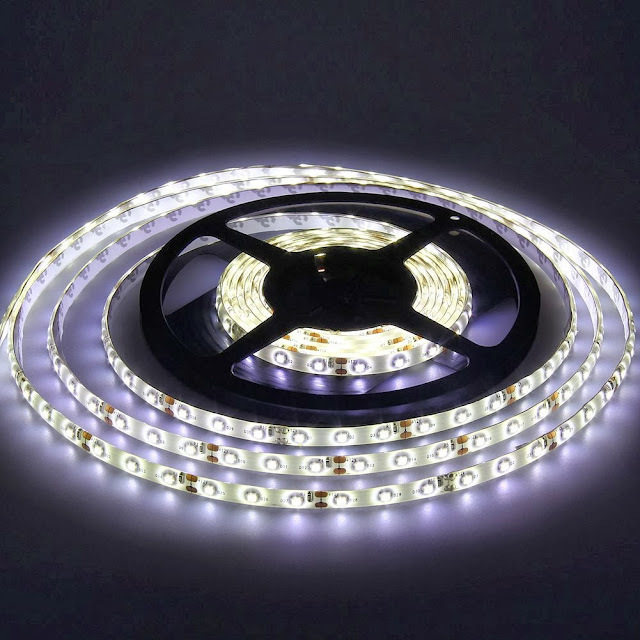 It comes with the LED lights on a reel, with wires at both ends. 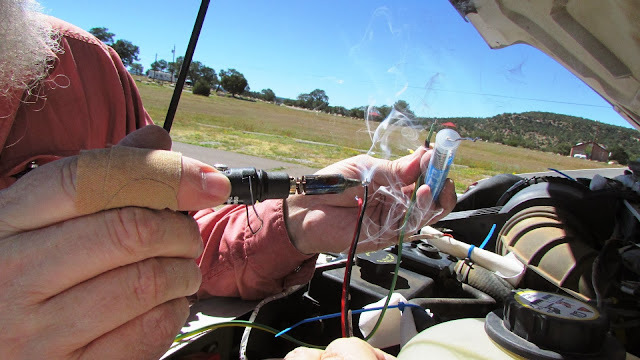 Andy soldered the wires on one end of 12v plug to another length of wire he had on hand so we would have enough wire length between the 12v plug/receptacle in the dash and the LEd lights in the engine compartment. Before it reached the LEDs in the engine, the wire had to go from the inside of the cab, through the door jamb, behind the fender and out into the engine, where it was soldered to one end of the LEDs. 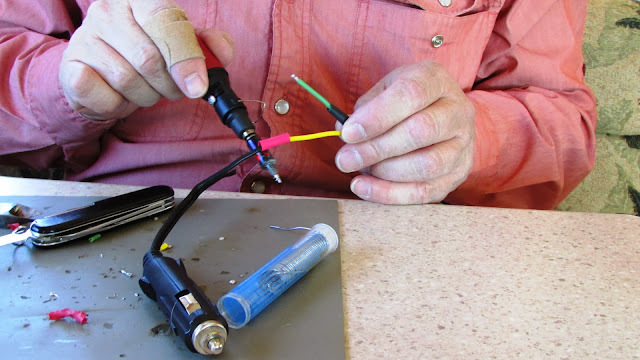 When he had the wires soldered together, he shrunk the plastic tubing so it would stay over the soldered area, keeping everything neat and protected. Below is Andy's butane soldering tool. 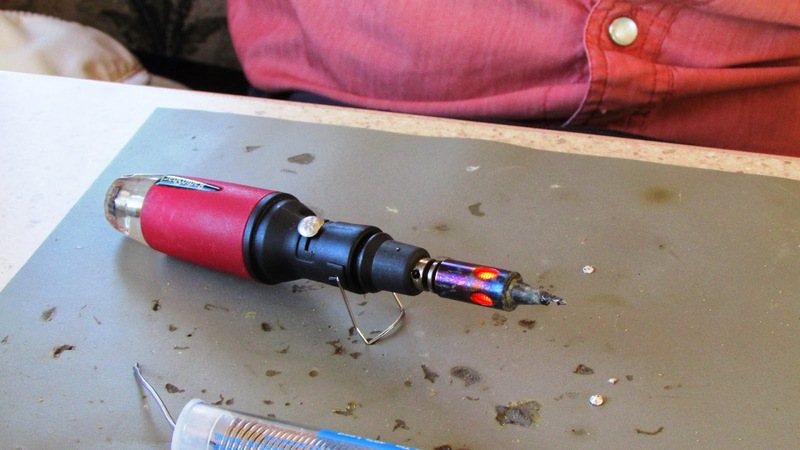 The tip is used for the soldering, and the heat coming from the red-hot openings was used to shrink the tubing. 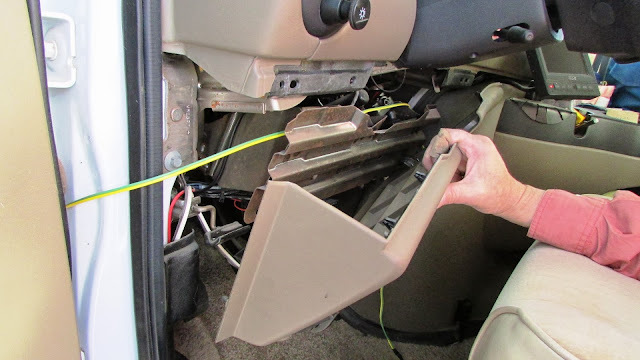 He took the dash cover off so we could thread the wire behind the cover from the right side by the 12v receptacle to the other end by the door. See the green and yellow wire? Feeding the wire into the door jamb and through the area behind the fender. 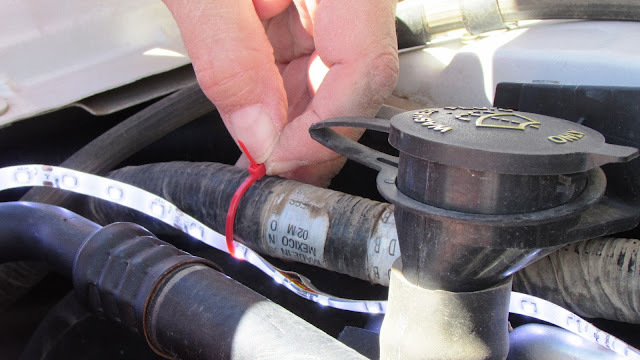 Using a "grabbing" tool to grab hold of the wire and pull it through the fender area and out into the engine. 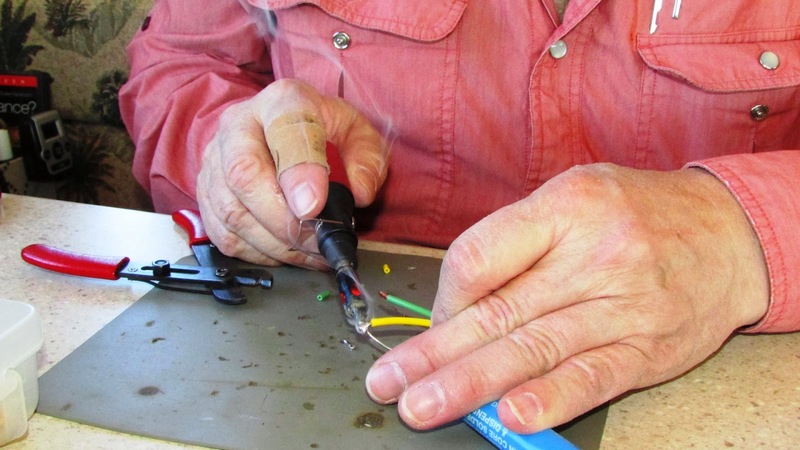 Once the wires were out, they had to be soldered to one end of the LED light wires. Hazel dropped by after her day of volunteering at the Visitor's Center, and found us working on this project, and she stepped up to help so I could get some photos. Joking around - do you think Andy has been to Mardi Gras? 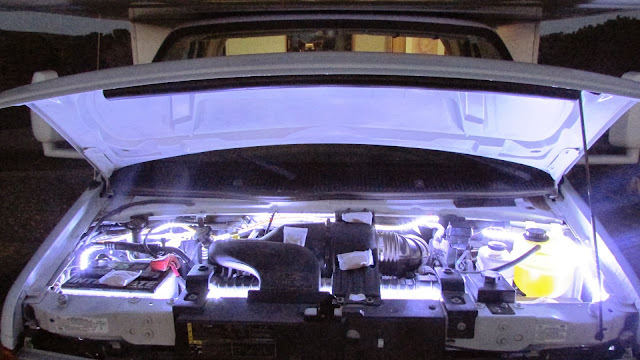 Next we draped the line of LEDs around the engine, making sure to drop some into the now empty rodent nest area (photo to follow) in front of the headlight in an empty, flat area. We were careful to keep the lights around the edge of the engine - away from any moving parts or areas where the heat would be too high. When we were happy with the way the lights were laid out, we zip tied them in place. Then Andy put shrink tubing around the other two ends of the LED wires to keep them from touching, and we were done. Fleur and Power needed their walk, so Hazel took them around the campground with Katie keeping her company in the car. Since I was still busy with the LED project, I stayed home to keep working. (Wow, look at that shiny car.) Katie LOVES Hazel, this "play date" wasn't with Fleur and Power, it was definitely with Hazel. 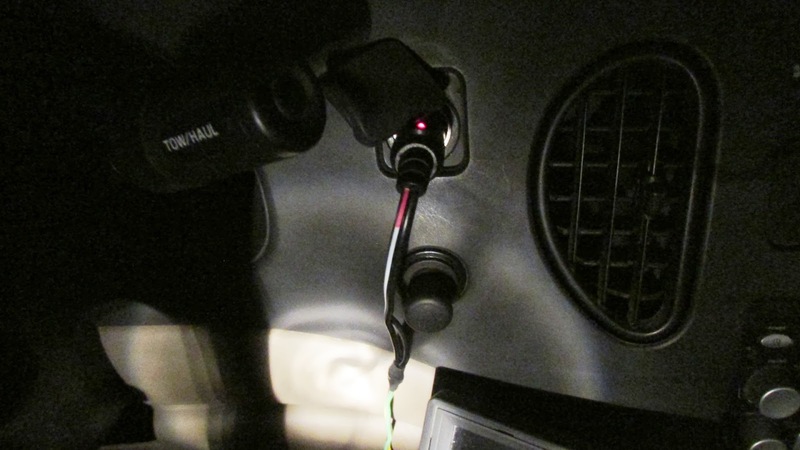 So, every night when it starts getting dark, I plug the 12v plug into the dash receptacle and the lights go on. In the morning, I unplug it. I have a sticky note attached to my computer so I won't forget in the morning. The lights take up a very small amount of energy, so I don't have to worry about them draining the truck's battery. I am starting the engine every four or five days, though, just to make sure. Whose little ears are those, sticking up in the windshield over the hood? And that's how Andy, with my help and company, rigged up a reel of LED lights into a rodent deterrent in my engine (and his). 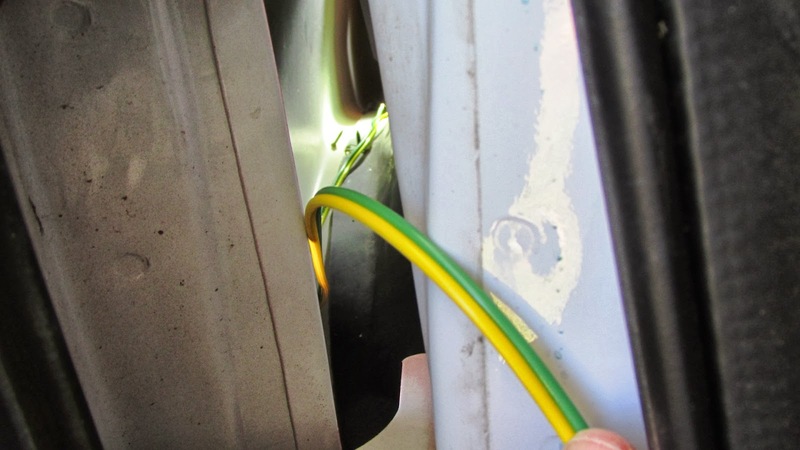 The photo below is of the area right behind the driver's side front light. There is a flat area there that's apparently perfect for a rodent's nest, because I found this in mine, a pretty big nest, and when we later checked Andy's engine area, he had a nest in the same spot. I had no idea it was there, but Hazel kept telling me I had to have a nest somewhere because of all the little mice I was finding a few months ago. I was lucky that the mice brought in all the nesting material and didn't take anything from my engine wires, etc., to build their nest. 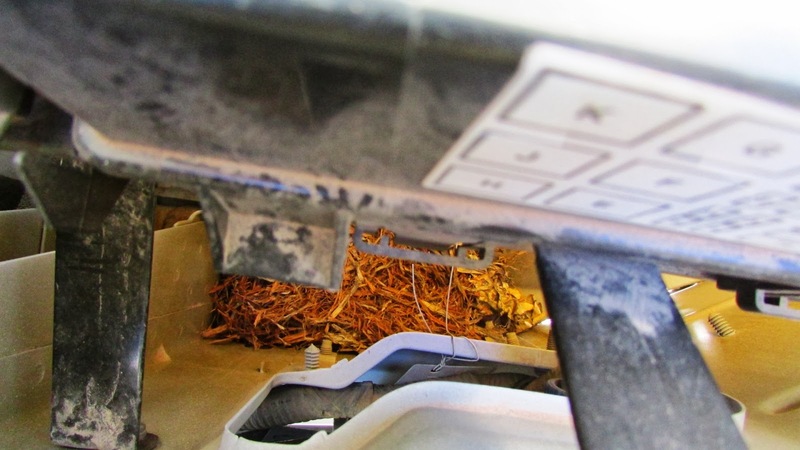 If you park your motor home where rodents are, check this area in your engine, too. You might be surprised what you find. This photo was taken standing in front of the headlight, looking down. See all the "stuff" there? That's a rodent nest. 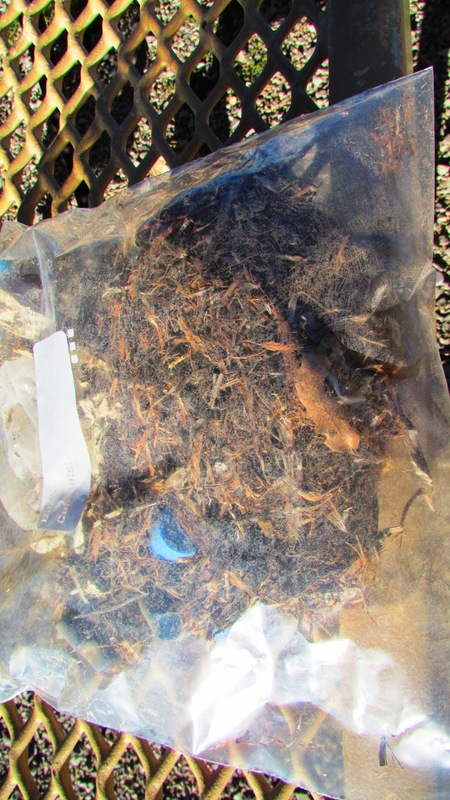 I reached down three or four times and got most of it out, putting the material into a baggie each time. My arm went down easily, but it was hard to pull it back out. I scraped my arm and got some scratches, so as soon as I got as much as I could out, I sealed the baggie and went in and washed my arm with soap and hot water, and later put alcohol on the scratches, as suggested by Hazel and Andy. This is the baggie full of nesting material. It went directly into a dumpster along with my mask and gloves. I am still putting my Fresh Cab into the engine when I'm parked and every night I've plugged in the LEDs. I'm pretty confident that I won't have any more critters in the engine. And so far, the cabin has been rodent-free, too, since Hazel and I plugged up all the holes a while ago. It was a pretty easy mod, but without Andy's knowledge and tools and materials, I couldn't have done it. When I ordered the LEDs, I thought they would come with a 12v plug on one end. I was pretty surprised when they arrived with just wires at both ends. Thanks, Andy! I appreciate that you were so generous helping me get this done. I couldn't have done it without you. Today we are heading southwest, toward Quartzsite. Yeaaaaaaa! We're leaving late morning, so I don't know how far we'll get, but it's getting too cold here at night, so it's time to move on. Yours and Andy's solution to the rodent problem is very illuminating. Loved all the detailed photo's. 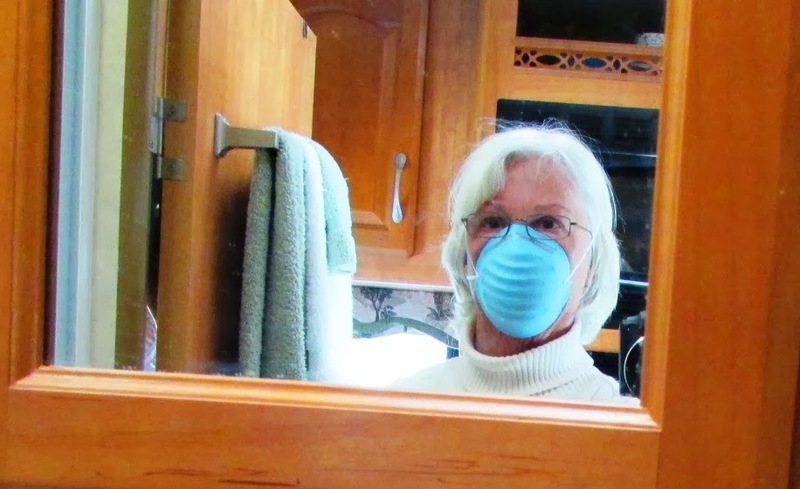 Have to get me some of those masks for "just in case" type chores. Never thought of it before. Let us know how well it works. It sure does look pretty! That Andy is pretty handy! You did your job by documenting the entire process. Will be interested to see how well the lights work and hold up. Sounds like a good solution. I know lights work for wood rats (pack rats), but I'll be interested to see if they work for mice too. That Andy is so clever! Hope the lights work. Fabulous fix! Glad Fleur is okay. Excellent documentation! I checked my truck and see that there's a nest in the same spot. Thanks for showing that. Take your time driving to Q. Looks like it'll be in the mid-90's through Tuesday. Mouse free and on to Q. Definitely getting too cold up in the higher elevations. Very interesting...I hope the mice don't think it is warm and cozy! Good luck and keep is posted! The nest stuff you pulled out looks positively lucky, and you were smart to take precautions. I hope that is the end of your problems with rodents. great photos of the process. I've been told to be very careful around mouse and rat nests. We stayed at a park that had a mouse problem. We couldn't figure out why all the permanent residents had rope lights under their hoods. Now we know why! Nancy, I'm glad you found the nest in your engine area, too, before any damage was done, I hope. I'll let you all know how the lights do. HOLY CRAP !! I'll be checking my engine compartment first thing tomorrow morning. If this works for you I'll definitely be doing the same thing to my rig. The LED lights are hooked up to your engine battery if I read your explanation correctly ? Not your house batteries ? Denise, the 12v plug is plugged into my cigarette lighter, because it's the closest to the engine. But you could plug it into another 12v outlet if that works better for you. Andy was thinking about cutting a hole in the dash and installing an on/off switch, but the way we did it was quicker and easier. The on/off would probably be a better mod, but I didn't want to cut a hole in my dash. With all those lights shining through at night, maybe it's easier to find you. I was wondering about the drain on the battery too. The last thing we'd want is to find out we couldn't start the engine the next day. I sure hope that helps your rodent problem. It looks pretty cool too! Here's hoping this takes care of the rodent problem. WHEW ! No nests in my engine compartment. I just read that BLM has shut down their office and is not issuing permits for long term stays at Quartzsite. You can apparently stay in the two week area for now. Excellent description of the installation process, and the lights look quite impressive! I sure wouldn't stick around if they were in a possible sleeping space! Just so you know, I've read in the last few days that Quartzite is currently affected by the government shutdown. They aren't issuing any permits, but the 14-day visitor areas are open. Rodents seem to be a big problem with full timers. I hope this works! Glad to hear you haven't had any permanent damage under the hood. And it is great that you and Andy were able to work together to get both your rigs mouse-proofed. 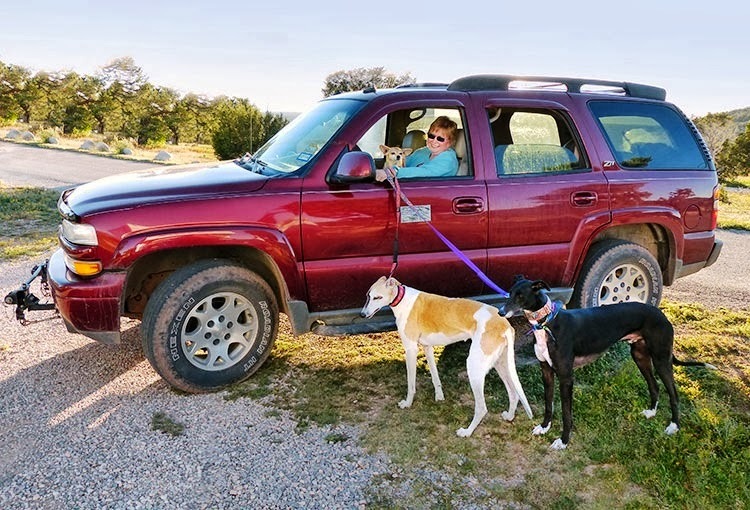 What with the varying places, seasons, and animal populations we RVers encounter, it's hard to find solid proof of the success of any one deterrent method. But given the under-$10 cost of installing these lights, Barbara and I both figured it was worth doing, and she's done a great job of documenting the installation. I'll just add that the 16.4-foot rope of lights that we used draws only 1.1 amps at 12 volts, so I leave mine on around the clock--my solar panels can easily take up the slack on even a cloudy day. Surprisingly, there's very little light visible from outside the rig. Those LEDs are very bright, but most of the light they emit bounces around the engine compartment and not much comes out the bottom or through the grille. Probably just as well... otherwise it might attract moths! "Maybe this space could converted to a sloping surface unappealing to the nesting types, even if it's just gluing a plastic bottle on to it." That looks like something worth doing! What a greta idea to deter rodents from your engine. When I camp hosted in Central OR two summers ago I had pack rats in my engine. Not an easy thing to get rid of. Luckily they didn't do any damage. Wordless Wednesday... Ready for a Chuckle? Wordless Wednesday...Just SO darn cute!